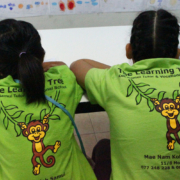 oh Samui Language School are proud to present our sister-school, Krabi Language School, which will be opening soon! Our new language school provides up to date, affordable courses in Thai & English for both children & adults, using a combination of conversational and textbook teaching. Due to our excellent relationship with the Ministry of Education we can help you attain an Education Visa, also known as a ‘non-immigrant ED visa’, which can allow you to live in this beautiful country for up to 5 years.